Arthur and Judith have just retired from work and they’ve decided to move into some quieter place. After some time spend on thinking and considering all the aspects, they’ve decided that a small town would be the perfect place for them, where they could continue their lives without the noise that comes from the urban living in the big cities. The two retirees buy a house in this small town and they are very surprised by their new neighbors and the positive welcome they have for them. The neighbors offer to help them in the process of moving in because every process like this is rather complicated. All the stuff that come from the old house should be placed in the new one and that has to be done with a lot of attention because usually most of the objects are fragile. The new neighbors are already here, waiting to start helping and Arthur and Judith are very happy about that. 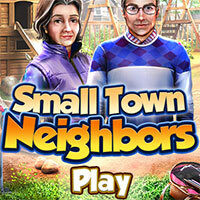 Small Town Neighbors is a free online hidden object game on Hidden4Fun.